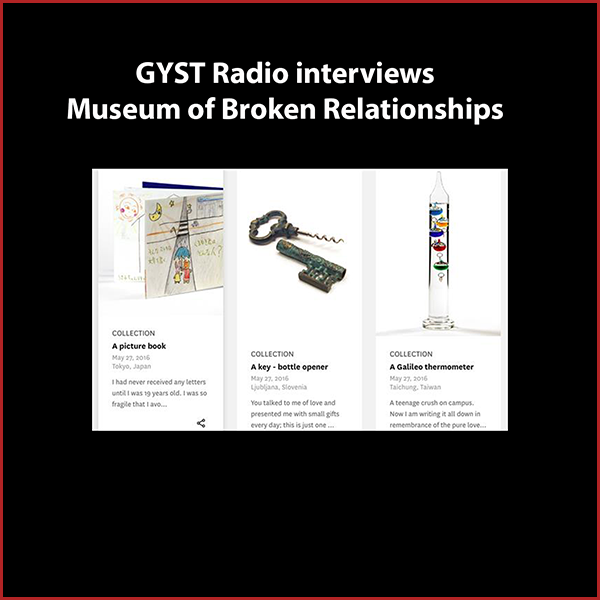 Guest is Alex Hyde, Director of The Museum of Broken Relationships. The Museum of Broken Relationships grew from a traveling exhibition revolving around the concept of failed relationships and their ruins. Unlike 'destructive' self-help instructions for recovery from failed loves, the Museum offers a chance to overcome an emotional collapse through creation: by contribution to the Museum's collection. Conceptualized in Croatia in 2010, the Museum has since toured internationally in 20 cities so far, amassing an amazing collection. The Los Angeles location on Hollywood Boulevard was openend in May of 2016 by John B. Quinn. The Museum of Broken Relationships puts the stories of real people on display with an item related to their failed relationships. These personal stories reflect the entire spectrum of break-ups, from the devilishly funny to the traumatic tales of lost love. The collection shows how we all share the same problems, no matter our nationality or background.